As a huge Transformers fan I have always felt that games based on this brand were either ok or just flat out sucked. The movie games tried to add visual touches and 80’s skins to make it more appealing to die hard fans but in the end the formula wasn't as successful as they had hoped. Activision decided to try something new with this title now taking place on the Transformers home world Cybertron. While some are not fans of that concept I am simply because it removes the need to be locked into real world vehicles. I am sure people will complain about space tanks and space jets but I honestly think the may have got it right this time in terms of game play and fun factor. Not to mention that you can create your own Transformer to go to the war with the Autobots or Decepticons. I only hope that the customization is as good game play wise. 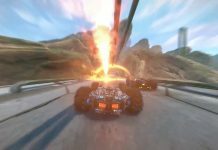 Check out the game play and multiplayer trailers and judge for yourself. None of the videos before had any chance of winning me over. The character creation video, while it didn’t show more than 5 seconds of actual character creation, certainly won me over with the actual gameplay footage. The gameplay video failed for showing nothing but cinematics. I am surprised you liked it Ant. I wanted to put up some other video but had to take it down. I should have something for the forums in a few days though.